A SEER rating is a maximum rating of efficiency for your HVAC unit. This means that though the SEER rating displays a certain number, it’s not always working at that number – the SEER rating number only displays the maximum level of efficiency it can operate at. SEER ratings are super simple if you just think about them the way you think about MPG in a car. Your car displays a certain MPG, but if you’re revving the engine and speeding down the interstate, you’re probably not going to get the listed MPG. Apply this concept to your AC unit, and you can see how constantly changing your home’s temperature can result in a decrease in efficiency and suboptimal SEER rating. Are High SEER Ratings Worth it? If you’ve heard the common sales pitch “this SEER rating will pay for itself in 10 years”, or something like that, then we hope you haven’t fallen for this. Remember, SEER rating is a measurement of maximum efficiency. It’s the limit of your HVAC unit. This means that if you are putting some heavy usage on your AC unit, then you’re definitely not getting that high SEER rating number that is labeled on your unit. In all honesty, we’d prefer to be the HVAC contractor that achieves success by customer trust and long-term repeat customers, not sales pitches on expensive high SEER equipment – that’s why we’re telling you all of this. In fact, we’d prefer it this way, otherwise our customer service line would be flooded with irate customers. We don’t want that, you don’t want that – let’s move on. Many of our customers wonder how they can save money while at the same time upgrading their SEER value. The biggest misconception out there is that you’ll improve your SEER rating by purchasing a higher SEER condenser. Well, you can’t! You can’t just upgrade one HVAC component at a time and expect a higher SEER rating. Not to mention that many components are not compatible with each other causing a whole other batch of headaches to deal with. Stick to this rule of thumb – if you really want that higher SEER rating, have an entirely new HVAC system installed, please. We hope this sheds some light on SEER ratings and that you have all the information you need to make an informed decision about your new HVAC installation, repair, or maintenance. 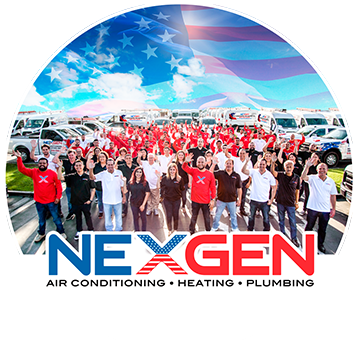 Thank you again for reading and please call or contact one of our NexGen technicians for any questions you may have about SEER value or any HVAC related concerns. ← Should I Get a Smart Thermostat? We Say Yes!